Many TV shows have realized the value of bowing out gracefully before they get long in the tooth. 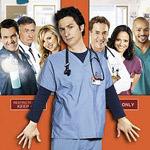 So it is with Scrubs, whose 7th season (which started 5 days before season 6 was released on DVD) will be its last. The sixth season sees lots of big changes and bold moves. It’s the season where Turk and Carla’s baby is born. It’s the season where J.D. and his girlfriend become pregnant (and even contemplate abortion!). Elliot buys a house. And yes, it’s the season that contains the episode My Musical, in which a patient (Stephanie D’Abruzzo, of Avenue Q fame) suffers a head injury that makes her hear the doctors as if they were singing. It’s a flimsy but sufficient excuse to include a half dozen musical numbers and interludes. After any show becomes as old as Scrubs is, it’s fair to ask whether it has finally jumped the shark. And while Scrubs is reaching maturity, I would say that it isn’t quite over the hill. We got familiar and comfortable with the characters in season 3 or 4. There were big conflicts in seasons 4 and 5. There are big developments again in season 6 but they seem to be changes toward stability, and not the introduction of larger conflicts. The show feels like it’s coming to terms with its characters and letting them settle into steady lives. In another season, I think we’ll be able to wish them a fond farewell, just before they wear out their welcome. I have friends who disagree, including a nurse who has lost her enthusiasm for the show and who didn’t particularly like the musical episode. But I would say that the timing of creator Bill Lawrence is just about right. Season 6 on DVD is essential for collectors and long-time fans. The best feature on this three-DVD set is a tribute to the third-tier characters. It’s the perfect feature for a DVD about a television show. When a show runs as long as Scrubs, the producers and actors do little things to amuse themselves. Some of these inside jokes take on a life of their own. The “Third Tier” lets us in on some of these recurring jokes (that we may have only noticed after the third or fourth time), and reminds us of how they first started. There are also alternate takes and deleted scenes, as on previous DVDs. The alternate takes are never as funny as you think, but it’s nice to see the actors getting to do some ad-libbing. Neil Flynn, as the janitor, seems particularly good at improve. The deleted scenes are presented well. First the DVD shows the scene “as aired” and then it shows us how the longer version of the scene would have looked. The centerpiece of the extra features is the musical episode. There is a featurette on the making of that episode with interviews from writer Debra Fordham and guest star D’Abruzzo. There are also brief talking-heads interviews with the cast and producers. Each of the recent DVD releases has included a longer interview with one of the cast members. This time Judy Reyes takes the mic. Her favorite episode so far? My Musical. There’s also an Easter egg on the disc with Lawrence and producer Randall Winston revealing some of the secrets in Season 7. Will Dr. Kelso be driven out of his job? Will Elliot become pregnant? Those are two of the possibilities, but we’ll just have to tune in and see. There are also several episodes with audio commentaries, but after being burned on every other set with unprepared and uninteresting audio tracks, I wasn’t willing to brave any of them, so you’re on your own.